County Sections - Five Days, Five Hours and Five Different Venues! Featuring a range of wild angling venues in this area renowned for its coarse angling and scenic beauty. Convenience and access is also top of the list whilst the aim is to show just a sample of the natural wild angling on offer in the region. With no more than a 30 minute drive between the draw hubs based in the lively Lakelands towns of Ballyconnell, Co.Cavan, Ballinamore, Co. Leitrim and Enniskillen, Co. Fermanagh draw locations at each of these make for short onward drives for your days fishing. Route maps and GPS locations will be provided in order to help you plan your journey. 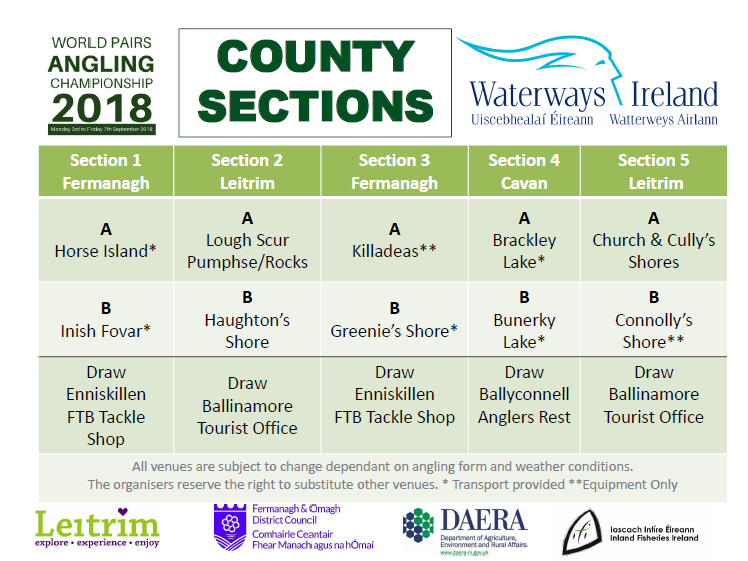 Anglers will be asked to draw their county section at the Opening night on Sunday 1st September allowing them to head in their pairs for the daily regional draw, closer to the venues for the five hour matches. At the Opening Night anglers will draw Monday's county section and the others will follow in sequence i.e. 23451, 45123. Each county section will have A and B venues to ensure paired anglers do not draw the same venue. Anglers will draw their A or B section daily. The table below shows the sections that were in use for the 2018 event which will give you an idea of how it works. All venues are subject to confirmation and may change at any time particularly due to current weather conditions.